In this article you will learn how to make filters on AeroCRS system. For your convenient, we've added interactive video at the bottom of this page, that cover the steps in this article. This video is offered to you as an additional way to learn how to accomplish the below written steps. 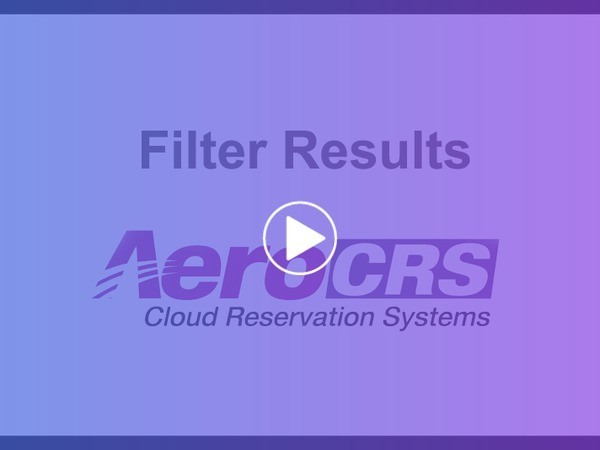 Filter option is one of the major and most important features AeroCRS has. During time you have many records of information in the system, and its start to be hard to find specific information in a sub-module. The filter button, narrow down the results so you can find the information much easier. In order to use the filter option, for each module you can find the filter button. Each sub-module has it own specific filters criteria, according to the information listed in the sub-module. Quick filter is the option to create a filter and review the results without creating specific button for the filter, for future use. The system then show you the results of the selected filter option. We have created the option to save a permanent button for filter you may use a lot. The filter buttons are individual and created only with the user who has created it. In order to create Saved button filter, click on the filter button, and select the filter option you would like to filter, just as we did in quick filter. In order to delete Saved buttons, click on the filter button one more time. In the filter popup screen, you see now a list of all saved buttons. Click delete on the one you would like to delete. Once the filter is on, a new button is now showing on the sub-module bar, clear filter. Use that button to un-filter the results and review all data.